Lendlease has received State Government approval to commence the first stage of its $1.9 billion Melbourne Quarter development on Batman Hill, opposite Southern Cross Station. The Melbourne Quarter project will improve the link between the Hoddle Grid and Docklands, creating new parkland and office space and generating about 15,000 jobs in construction. The approval includes a 2000 square-metre elevated park to be built over part of Wurundjeri Way and Collins Street, which is expected to be complete in 2018. A $200 million 19-level commercial tower, designed by Denton Corker Marshall, has also been approved for Aurora Lane and Collins Street. The tower includes more than 30,000 square metres of office space, 177 car spaces and 210 bike spaces. "This project adds greatly to the public realm, I enthusiastically support projects which contribute to the surrounding streetscape and create places where people want to live and work," Minister for Planning Richard Wynne said. Melbourne Quarter has been designed in keeping with the area’s historic industrial surrounds, showing how urban regeneration can maintain history and character while also providing for new A-grade office space. 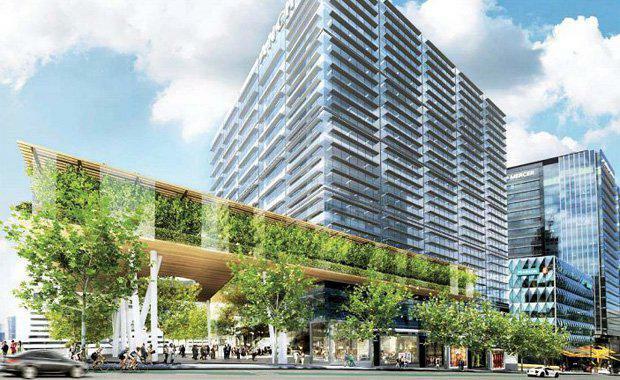 Lendlease will deliver the Melbourne Quarter project, which covers 2.5 hectares, over the next decade. Subject to future approvals, the project will include seven commercial and apartment buildings. The project capitalises on the strong demand for A-grade office space and large floor plates in Melbourne’s CBD, and makes good use of an under-used inner city space. The approval was supported by the Department of Environment, Land, Water and Planning and the City of Melbourne.